As we age, we are exposed to sun and gravity, and see the signs on that on our face. The surface skin may develop dark spots, wrinkles and folds. It loses its elasticity. We also lose fat, and therefore volume, in our cheeks. Our forehead, jowls and jawline, or neck may start to sag. Exactly what we see depends on our genetics, our skin, and our lifestyle. But here’s the thing: changes happen well below the surface as well, in the deepest tissues and muscles of our face. Most facelift techniques do not address these deep issues. Today’s “lighter” facelift techniques target specific areas of the face. For example, a mini-lift reduces jowls to produce a smoother jawline, and a neck lift smooths wrinkled or sagging neck skin. An SMAS facelift – SMAS stands for Superficial Muscle Aponeurotic System – also addresses the lower third of the face but targets deeper underlying tissues. SMAS results are most noticeable, so this technique is often a good choice for adults in their 50s or 60s with more obvious signs of aging. Unlike these other techniques, a deep plane facelift addresses more of the face, specifically the mid-face and cheeks. It is designed to smooth nasolabial folds and reduce under-eye hollows as well as tighten the jawline and upper neck. What does a deep plane facelift surgery entail? All facelift procedures tighten skin and reposition underlying muscles. In some cases, Dr. Raval also uses a dermal filler to replenish lost volume. What is different about the deep plane facelift is that it targets the facial layer between the SMAS and facial muscles that form the structure or “planes” of the mid-face. Instead of separating skin from the underlying SMAS layer to make shallower adjustments such as in a mini-lift or even an SMAS facelift, Dr. Raval works underneath the SMAS. By releasing certain ligaments, he can reposition the cheeks higher and then reattach the ligaments with sutures. This technique requires tremendous skill. 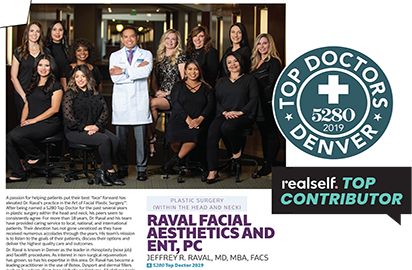 By choosing Dr. Raval, you can be confident your face is in the hands of a surgeon who is highly qualified and experienced. The surgery is performed as an outpatient procedure in an accredited surgical facility. Dr. Raval may use a local anesthetic with deep sedation, or he may recommend a general anesthetic. Either way, you can go home the same day. Interestingly, because the surgical procedure targets only deep tissues, there is less post-surgery surface swelling, bruising, etc. 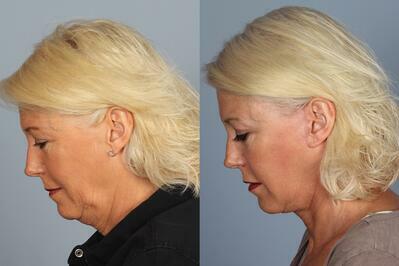 On the other hand, there is more recovery time with a deep plane facelift than with other options. For most patients, downtime is about ten days to two weeks. Because incisions are hidden in the hairline, they will not be visible unless you choose to show them to someone. You will look noticeably younger, but naturally so -- refreshed and well-rested. Who is a good deep plane facelift candidate? You can get a facelift at most any age, as long as you are generally healthy, although men and women who are good candidates for a deep plane lift are generally older, with more significant signs of aging. Whether a deep plane procedure is the right surgery for you also depends on which areas of your face you wish to address. It’s best if you’re a non-smoker, because smoking interferes with blood flow and, therefore, recovery. As always, a personal consultation is the best way to learn more. Dr. Raval will want to know about your aesthetic goals and have a chance to examine your face in person. He will also want to know about your medical history, especially any past surgical or even minimally-invasive facial procedures including Botox or dermal fillers. Together, you can decide if a deep plane facelift is the best choice to rejuvenate your face.